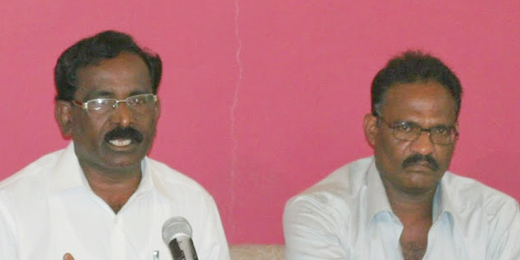 Udupi, July 27, 2015 : Briefing the media, Kartnataka Dalit Sangharsha Samiti, Udupi District General Coordinator Lokesh K said National Highway Authority has taken good decision helping out 24 dalit families by deciding to construct highway in place of bypass in Padubidri. The earlier proposal would displace more than 50 houses. Vested interests are trying to safeguard their immovable properties such as bar and restaurants and so on demanding formation of bypass. Bypass would seriously hamper the lives of many and displace the poor class. He pointed out the CM bowed to lobbies of the affluent in the area and had issued the circular directing construction of bypass on January 27, 2012. The samiti has collected documents supporting allegations. Presently government has finally taken a decision to widen national highway 66 at its present location that passes through Padubidri town. The proposal supporting the bypass is currently dropped. The government has already served 3A notice for evacuees of Padubidri Town to widen the present highway that passes through Padubidri Town. Condemning the protest held by Committee of National Highway Distressed Persons, decided to observe Padubidri bandh, greedy people are depressed over demolition of houses, shops, and business establishments in the town. The bypass road would also end up in the destruction of agricultural land. He said there are no centres of worship in the region as claimed by vested interests. The government should not succumb to pressure and go ahead with the decision to construct national highway in the present location. The demand for building bypass road to the east of the town at the area already identified should not be entertained.